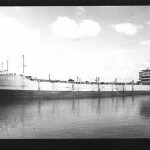 MV “Rhexenor” in Glasgow, 1952. Built 1945 as Empire class fast freezer cargo. 10199GT 15 knots. sold 1975 for scrap. Photo supplied by John Garner. 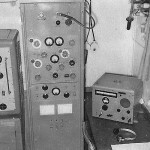 MV Rhexenor radio room – equipment was Redifon. Photo supplied by John Garner. Rhexenor/ in what looks like a Skyfotos shot outward bound in The channel. 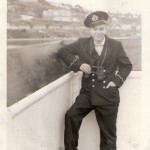 John Garner aboard MV Radnorshire. Photo supplied by John Garner. John Paskett just about to swallow the anchor. Taken on board Radnorshire/GMRS. 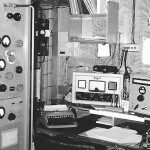 Radio room of MV Radnorshire GMRS. Built 1948 7362GT 15.5 knots. sold 1979 for scrap. She was 6th “A” class to be built as “Achilles” transferred to Glen/Shire 1949. Photo supplied by John Garner. Lombardy/GDZQ in what appears to be a Skyfotos shot in The Channel. R/O was John Paskett. 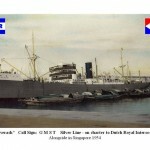 Silverash/GMST in Singapore 1954. 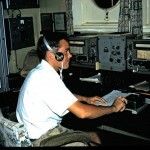 R/O was John Paskett. Royal Mail’s Drina with the wholly appropriate call sign of MAIL. R/O was John Paskett. 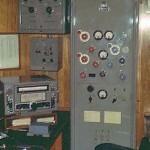 Radio room of Royal Mail ship “Drina” call sign MAIL. 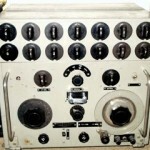 1945 experimental Marconi Equipment. Photo provided by John Paskett. Blue Funnel’s Adrastus. 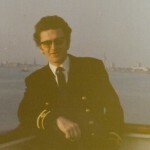 Taken on R/O Malcolm McLeman’s last voyage with the company. 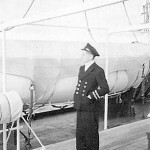 Glengarry was completing in April 1940 at Copenhagen when she was taken over by the Germans. 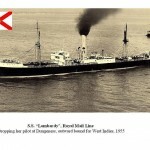 She was named Meersberg of the Hamburg Amerika Line. 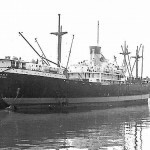 Then transferred to Kiel as a depot ship to U Boats. 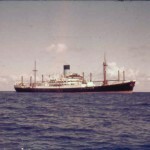 In 1942 she was converted to a minelayer and armed merchant cruiser “Hansa”. In 1945 recovered by British and named Empire Humber. 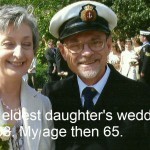 It is said the Holts got so frustrated by the Government on dallying about her return they sent a crew to Europe and brought her back themselves. 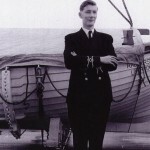 Returned to fleet in 1946 and named Glengarry. 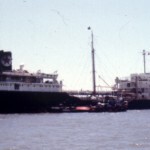 She was scrapped in 1971. 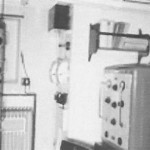 Radio Room: mv Longstone/GHHU. R/O was Colman Shaughnessy. 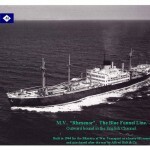 Radio Room: Jardine Matheson’s mv Collin/GOMF. A slightly blurred Colman Shaughnessy is the R/O. Not a sight all of us saw. 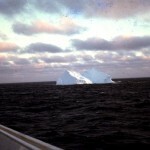 Colman Shaughnessy’s first iceberg taken in 1972 some 200 miles south of Greenland whilst on a great circle from The Elbe to the St Lawrence.. 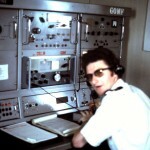 Vessel was mv Collin/GOMF. Those of us that suffered the North Atlantic will probably have seen icebergs which are, of course, particularly poignant in the 100th anniversary year of the loss of Titanic. 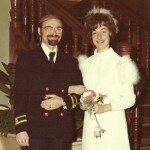 Mr & Mrs Ellis on their daughter’s wedding day. 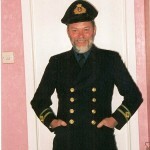 This proves that Dave can still fit in his uniform and how many of us can say that? 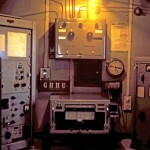 Radio Room: CaltexCanberra/GQDL. An unrecognisable ROA archivist Willie Williamson at the key in 1967. Willie Williamson on Swansea tramp Uskmouth/GUGF in 1961. In a futile attempt to convince us he can still get in his uniform here is Willie in a clearly Photoshop doctored image that fools no one. In Willie’s own words he looks more like a U Boat Captain. Radio Room: Wartime standard vessel Gatineau Park. R/O Art Sim steadies himself against the roll in February 1943. Photo credit: N Morant, National Film Board of Canada. 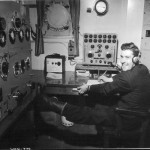 Just checked all four pages of ships radio rooms .Brilliant and very nostalgic. 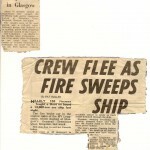 Regarding the Signing On Document pictured above concerning the mv Dunstan. 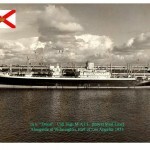 I served on the Dunstan from 3rd September 1955 to 15th August 1956. I believe that the call sign may have been GYFK. My disappointment was that during the period that I served on the Dunstan it did not go up the Amazon, but it did a lot of pleasant coastal hopping along the Brazil coast and nice visits to New York. David, Thanks for that QSL about ”Signing On” dreams. Relieved to note that I’m not alone in this!. Probably a profound Jungian explanation. 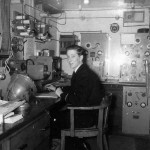 Mine go: eventually manage to suss the equipment and the Pilot’s departed etc, done the 1st visit to the saloon, cautious intro’s and back up on watch to realise with horror that no entries at all at all have been made in the Radiotelegraph Log…. Like for hours!. However, the buzz of being back in front of the Atalanta again is nice and then I awake to post 2000 AD ”normality”. Bugger!!. Still we got the ROA. so, 73’s OM. Bruce. Guys, Fantastic photos, more please. Pure nostalgia for our ”Glory Days” [ despite our complaints at the time!] I suppose and how looking at these shots of familiar equipment how marvellous it would be to be sitting at those desks again….. Hey, does anyone else have recurring dreams of ”signing on” to a new ship again?. 73’s. I just saw your note on the ROA site. I was your #2 on the Tantalus round the world voyage which was my first deep sea and I think you got to know my sister Margaret who came down to New York to meet me. I like in a small seaside town in Victoria, Australia after 26 years in Canada and I see you are in California. Hopefully you will get this and maybe we could share some photographs. Brilliant website guys. Well done. Photos to follow.